Do you remember the beautiful, old building that used to be the Gilroy City Hall at 7400 Monterey Street? 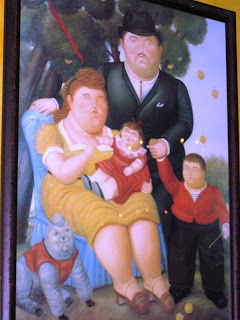 It was also home to Chips and Salsa, a Mexican restaurant. 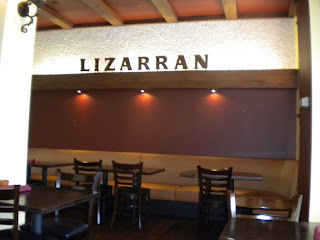 Well, it didn't last and it is now Lizarran, a Spanish tapas restaurant. 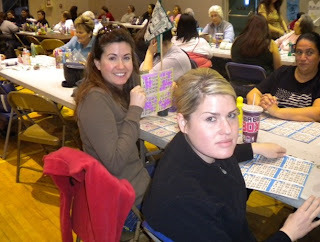 It sounded like fun so my mom and friend, Susan went on over to give it a go! 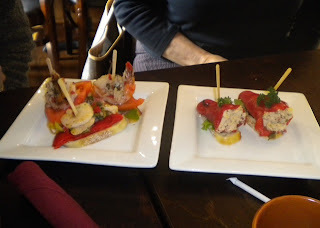 What is interesting about the restaurant is that they have a "Tapas Bar" with pre-made items. You pick and choose out of a glass display. 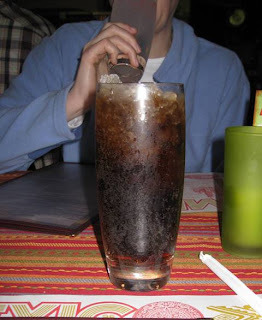 So, we did this to kick off the meal. You keep the toothpicks and put them into a ceramic dish - that is how you are charged at the end of meal - number of toothpicks. Kind of fun! Basically these are bites of shrimp, maybe a tuna mixture, peppers and tomato on slices of bread. They all were different but sort of had the same taste. I think the idea of the "Tapas Bar" is fun but we decided to continue on with ordering of the menu. 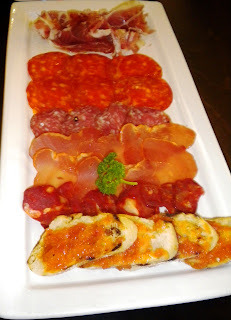 I know that this was the Tabla de Embutidos - which is an assortment of traditional Spanish cured meats. Tasty. Meat is good but we didn't order anything to go with it like cheese and they only served it with 4 slices of bread. So we just munched on the meat, which became old. I think we took the rest to go just because we were bored with it. 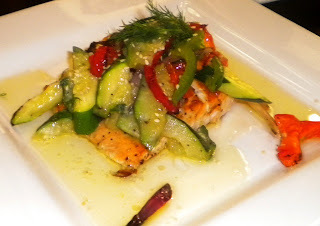 This is the Salmon a la Plancha which was basically grilled salmon served with sauteed bell peppers and onions. It was tasty, cooked well. Probably the best dish we were served that day. Cute little crab cakes! They were very tasty, I ditched the bread they were resting on though, no need for the extra carbs! 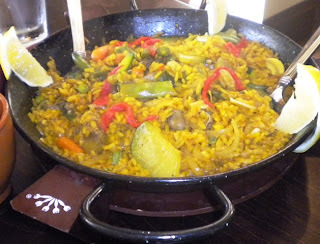 This is the Paella de la Huerta which is saffron rice with vegetables. It was pretty good. It took a little while for them too cook but we just took our time visiting. I probably wouldn't order this variety again though, there was a seafood version that might be worth trying. I did some research on this place after I had visited it, it is part of a chain and has locations located in Southern California. I would have never known! It is in such a beautiful building with the most precious courtyard, it is hard not to be happy while your there. I suggest you try it when your not too hungry and want to have a leisurely visit with a good friend over a couple glasses of wine. 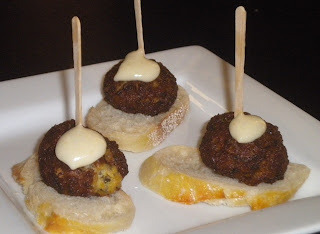 Stay a while, munch on some tapas - I was trying to imagine myself being on vacation while in Spain! Ha! Give it and a go and let me know! New restaurant alert! And make that another Mexican Restaurant at that! 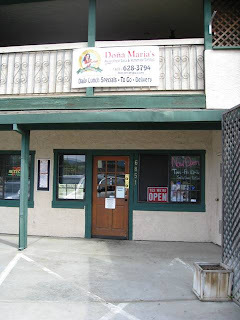 The small community of Tres Pinos has welcomed Dona Maria's in the fomer location of Mama Cass's Pizza Parlor. 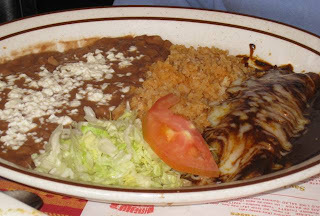 I had heard from a friend, of a friend, of a friend that it was really good home made Mexican type food. Was I excited to try it? Heck yes! Chips and salsa brought out instantly! 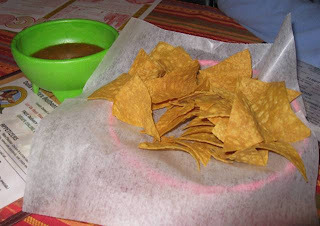 The salsa was good - it is like a puree, that is how I like it. Inside it is quaint and colorful! Kind of like you're in Mexico - Ole! I was a big fan of their crushed ice, you don't find that at too many places anymore. A pretty order of guacamole. Very festive and good - pico de gallo was in the mix. This is Sopa Azteca and it was FANTISTICO! I mean seriously. Very filling and delicious. 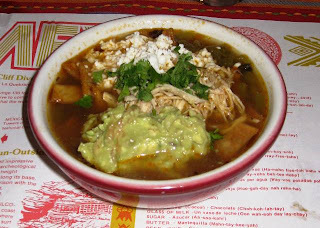 A rich broth that had simmered with onions and peppers included shredded chicken, queso, tortilla strips, south cream, guacamole and cilantro. You must order this! Too much food later... I also ordered this. I know it is excessive but I wanted to try everything. I am trying to become a semi-professional food blogger you know... Anyhow back to the food. I ordered a Two item combo of a Verde Enchilada - chicken and a Chile Relleno. 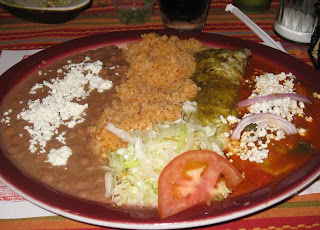 For the record, I ate the enchilada, 1/2 of the rice, two bite of the rellano and scoop of the beans. The enchilada was good, the chicken was moist and the sauce was tangy. 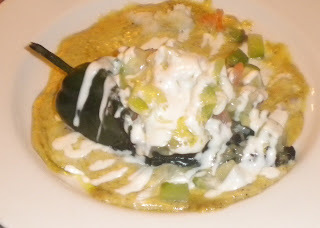 The relleno was ok, I hate it when they leave the seeds in it though. The rice was good, and the beans were well, beans. J-Daz ordered the Mole Enchilada and she loved it. She just was so full from the soup that it was hard to enjoy our meals! But, she did say it was tasty. 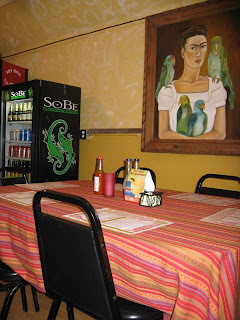 All in all my experience at Dona Maria's was a good one. They serve Margaritas and have them in a machine rocking and rolling 24-7. Beer is also in a fridge to enjoy with your Mexican meal. The building is tiny so if you get there and all the tables are taken, sorry Charlie! 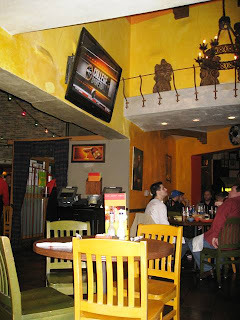 They do have a flat screen television in the corner so maybe you can catch your favorite sporting events there too! I think this place can do well. 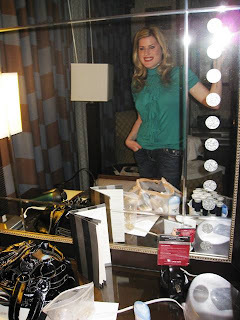 Check it out yourself and holler back at me with your experience! After the day at the Portola Spa in Monterey, yes I went to the spa again, we declared ourselves famished. 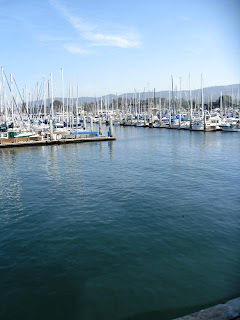 Just steps from the Monterey Wharf we decided to try somewhere we had never been before! 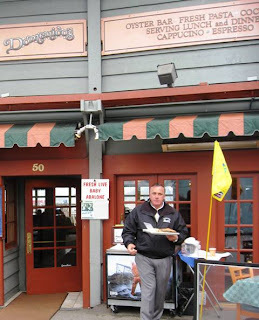 So welcome: Domenico's On the Wharf. Our beautiful view on a very clear day in Monterey. 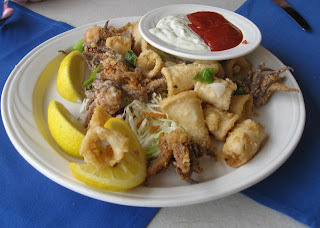 An appetizer of Calamari, yes please. I like to dip it in both the tarter and cocktail sauce. It makes for a pretty tasty experience. 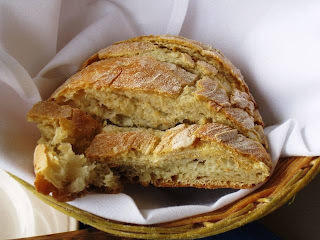 Fresh baked bread! Baked in house I am sure because it took them so long to get it to our table! Ha. But no really, it was very delicious. 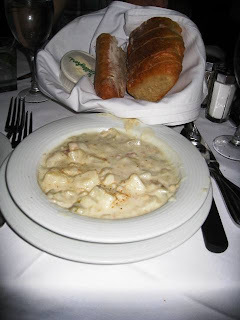 I sampled probably enough Chowder on the Wharf on our walk down Restaurant Row but I wanted more! This is the stuff dreams are made of. Not the best Clam Chowder out there but definitely a contender. Amanda ordered a Caesar Salad and I thought it was beautiful. 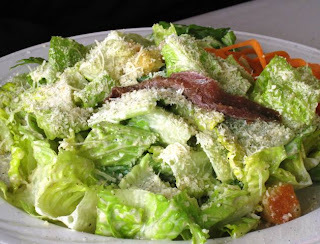 She enjoyed it very much and I was lucky enough to get to eat the Anchovy - I love salt! Oh Elena got a special! 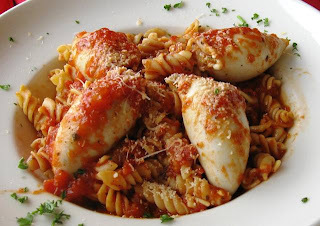 It was Calamari stuffed with cheese and sausage and all that fine stuff that goes into lasagna. That is what it reminded me of. She let me try a bite and it was ok - not something I would have ordered but certainly tasty. Domenico's: I have to be honest, you kind of let me down. I had high hopes because you sold us on the wharf on your fantastic views, you wonderful food and all that jazz. But you made this a 2 hour lunch without being really necessary - it was a Monday afternoon, after the lunch rush. Our waiter was in and out - bus boys randomly walking around. There was no need for the lengthy lunch but at least I was there with good friends and had a good time catching up with each other. So we went to this place Sangria's in Downtown Morgan Hill after our BINGO experience, and let me tell you it was an experience. Enough said. Located 17415 Monterey Road, you have to walk upstairs, through a hall and make a left. Kind of strange to get there but once your in, it is nice. "Would you like a glass of our homemade Sangria" they ask as you walk in. "Yes, yes I would." I was excited to try it but was disappointed when it tasted just like punch. $8 for punch! They brought out some tortillas and salsas. 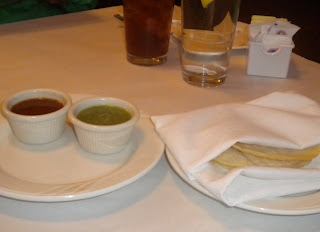 Have you ever tried to dip a corn tortilla in salsa and not drip it across the table and then into your mouth? I am pretty sure it is impossible. We saw tostadas on the menu so we asked her to please bring us out some of the crispy shells. Much better. The red salsa was good, the green one not so much. Guacamole! The photo kind of looks like an action photo right? It kind of was, it was made table side. After the our waitress left we added the red salsa to it because it needed something. It needed a lemon squeezed into too. 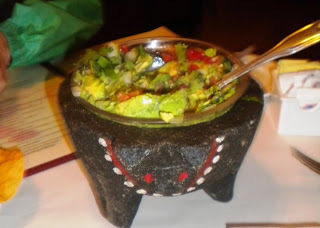 But it was still tasty - I love guacamole. 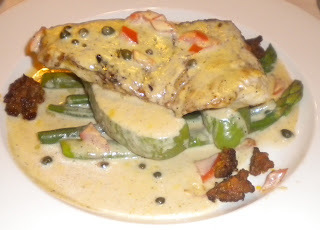 I ordered the Pescado del dia: Pan seared whitefish served with a roasted garlic sauce, capers, chorizo and vegetables. I like all fish and I like all cream sauces. But this one, seemed off. Was it the fish? The texture, maybe it was a touch undercooked. I don't know, it just wasn't me. My mom's order was next, she selected the Chile stuffed with Seafood: Fire roasted Poblano stuffed with shrimp, red snapper and chayote squash. I know poblanos are not to be too spicy but this one was, even for my standards. My mom can barely even have Mild Sauce at Taco Bell so she struggled with this one. 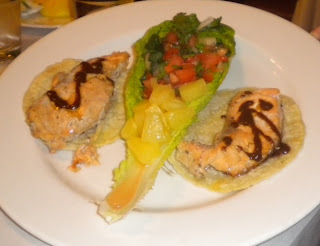 This is Jennifer's order of the Salmon Tacos. A pretty dish, she said it was ok. Kind of hard to mess this simple dish up! I think she also put more of that red salsa on it though! Sangria's was an interesting experience. The building is pretty, it had a beautiful wooden bar area - I liked that. 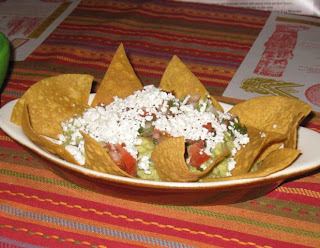 The idea of serving just corn tortillas with a drippy salsa is a challenge for all involved though. 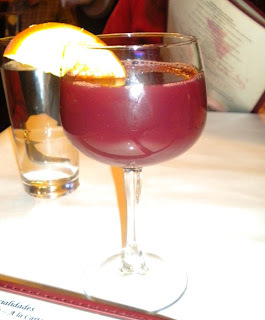 The actual sangria actually bummed me out - I think it was going to be a Signature Drink! Anyhow, if you want to check out something different, try it - you be the judge. Another cute place in Ojai... It is amazing how many great restaurants are located in one small, little town. I have been to most but haven't hit them all up yet. 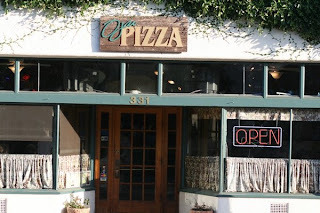 Ojai Pizza is located on the main drag and it usually pretty busy. Everytime I have picked up an pizza from here it has been BBQ Chicken Pizza - Southwest Sauce, Mozzarella Cheese, Red Onion and BBQ Chicken. 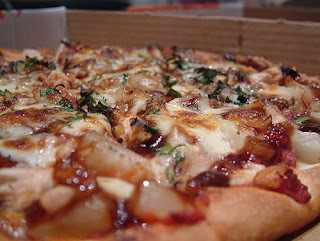 This pizza is so delicious. They really pack the ingredients on there. One slice really does the trick for me. You pretty much have to eat it with a knife and fork. Not much to say except it is really tasty pizza. I always pick it up to-go but have always been greeted by a friendly staff, prices are affordable and families seem to really enjoy hanging out there. There are other Specialty Pizzas on the menu that include the Santa Monica and the Bacon Cheeseburger Pizza. Yum yum! 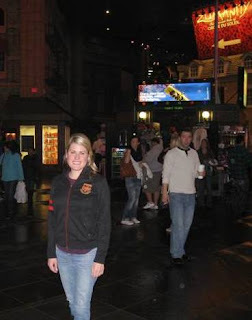 Melissa Good Taste had to take a quick trip to Southern California for potential exciting plans! The weather was beautiful so I went back to a wonderful spot I had been to before. Located at 419 East Main Street you can sit outside on the sidewalk or inside the patio. 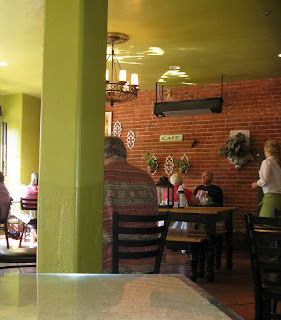 Inside the restaurant it is lime green and brick - sounds like an odd combination but it works. Just beyond the eating area there is a bakery with cases filled with all kinds of delicious looking baked goods. So, I ordered the Crab Cakes. I am sure you not surprised. I was a little bummed that I got there after they were serving breakfast because they serve the best Crab Cake Benedict I have ever had, ever! It was seriously amazing. Another great breakfast order is the Huevos Rancheros - Scott ordered it last time I was there and it was equally delicious. 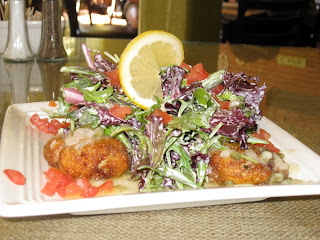 Since it was lunch, I got the Crab Cakes with mixed greens. Still wonderful but definitely not topping the Benedict. My suggestion: get there for breakfast! I love this little Cafe. I will return, hopefully next time I can snag an outside table next time. Did I mention how much I love Ventura? When we read: Meat and potatoes with Park Avenue flare! A table at Gallagher's Steakhouse, a New York City original since 1927, guarantees you an evening with sizzle featuring only the finest dry-aged beef and fresh seafood. We were sold! The finest place to dine inside the New York New York - ooolallaaala! 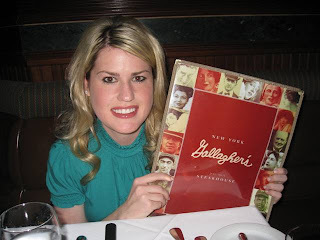 I was really excited to take a picture with this menu because the New York version of Gallagher's Steakhouse is so famous! I have watched the Travel Channel review on them and it was so interesting. 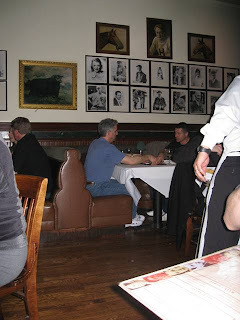 Established as a speakeasy during the prohibition years, Gallagher's Steak House is celebrating 81 years of operation. 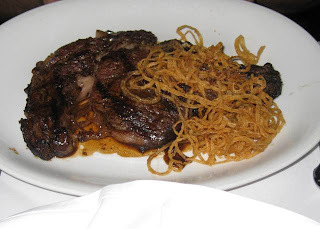 They are best identified by its signature meat aging room stocked with the best USDA Prime dry aged beef. Inside the dining room. We had a quaint little seating area. They really pack you in! Guess what Melissa Good Taste ordered first! Of course the Clam Chowder - I shared. 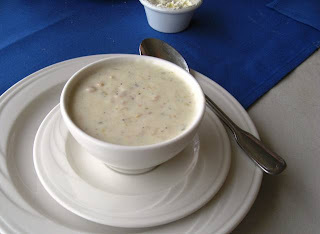 I have said this time and time again... Clam Chowder should not be all about potatoes. The flavor was decent but it truly was a Potato Chowder. Not a lot of seafood action going on there. 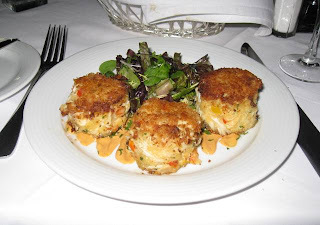 Another easy guess on an order of mine - the Crab Cake Appetizer. I let a few bites slip away but for the most part I enjoyed this solely. These crab cakes were pretty delicious. Very much the real deal. No bread crumb or cracker filler just sweet delicious crab. What a treat. And can you believe I ate this too?!! Well, not the whole thing but I certainly made my mark. Like I said this weekend I was really going for it! The meat was not quite medium it was more to the well mark. The meat was sadly not as tasty as I had anticipated. The shoe-string onion rings made a special spot in my heart. Yum! All in all the meal was pretty good. The setting was beautiful: dark woods, low lighting and pictures of famous baseball players and race horses lining the walls - very New York. 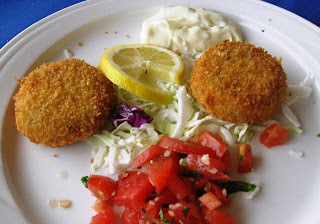 I thought most of the food was just ok, except for those stand out crab cakes! I would return to dine because of the atmosphere. Maybe I will venture off my seafood kick and try something new, they had a Mahi Mahi special that night that I was tempted to try too! Staying at the New York New York you given quite a few options of sit down restaurants. There are a lot of fast food but we wanted to sit down, relax after the flight and conversate. So we chose Gonzalez Y Gonzalez - the zing of saucy Southwestern fare complete with an outdoor courtyard, tequila bar, lanterns, and piñatas. We though this might be a fun option! Made it to New York New York - all checked in and ready to get another snack! Gonzalez Y Gonzalez seemed perfect for an appetizer and a beer. This photo on the wall cracked me up! I had to take a picture of it. So cute. 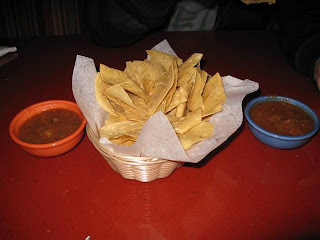 Decent chips and salsa: the one to the left mild and the one to the right, knock your socks off! 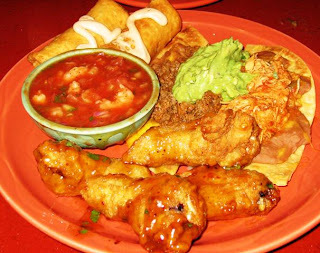 Gonzalez Combination Sampler: Gonzalez Nachos, half beef and half chicken, Honey-Chilpote wings, chimis and shrimp ceviche, served with sour cream, chipotle chile and guacamole. Can you tell the theme of the trip is clearly not healthy eating! Holy Moley. You only live once! This restaurant was just ok. Not authentic Mexican by any means. It served its purpose by being great filler but that is where it ended. Fun setting, great Mexican flair decor. 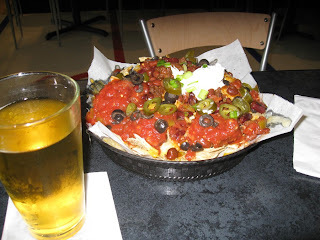 Might return if in Vegas to cure a hankering of chips and salsa and a beer. So we rushed, rushed, rushed to get to San Jose in time to catch our Southwest flight to Vegas and low and behold... we hit a snag! We were loaded up on the plane and then they decided the weather was too bad in Las Vegas so our flight was delayed. The rain supposedly was messing things up at the McCarran International Airport. They let us get off the plane and explore the airport awhile. 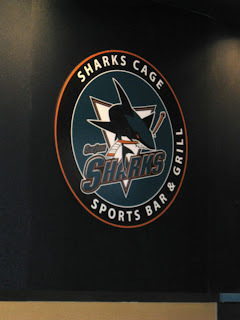 First stop, Shark Cage Sports Bar for the essentials on any adventure: a cold beer and super nachos! They were exactly what they were supposed to be, messy and delicious! Not an everyday treat, but they sure hit the spot! An hour and a half later we re-boarded the plane and off to Vegas we went! Last minute to trip to VEGAS! 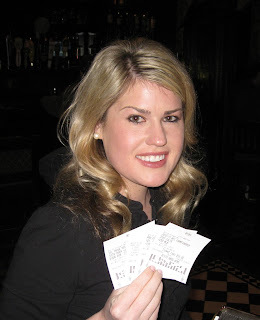 I placed my bets for the Super Bowl, and ate plenty of food too! Reviews to follow... Stay tuned! What is Zumba you ask? The Zumba program fuses hypnotic Latin rhythms and easy-to-follow moves to create a one-of-a-kind fitness program that will blow you away. The Zumba goal is simple: We want you to want to work out, to love working out, to get hooked. And I am hooked! Check it out yourself! It is a fantastic workout, I know I must have looked silly trying to rock my best Salsa moves... but who cares? It is fun!